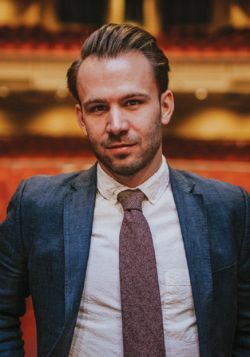 ANDREW CRUST is in his second season as Assistant Conductor of the Memphis Symphony Orchestra where he conducts Pops, education, ballet, corporate concerts, Classic Accents concerts, among others. In the 17/18 season, Mr. Crust conducted over 35 performances with the MSO. Mr. Crust also serves as a key representative in the community and in the schools, acts as cover conductor for every MSO concert, and serves as conductor of the vitally important Memphis Youth Symphony. In February of 2018 he stepped in to replace an ailing guest conductor for two successful MSO subscription performances featuring Bernstein’s Serenade After Plato’s Symposium with violinist Charles Yang. Previously the Assistant Conductor of the Portland Symphony Orchestra in Maine, Andrew conducted a variety of concerts, helped coordinate the orchestra’s extensive educational programs, and helped lead a program for concertgoers under 40 called “Symphony and Spirits”. Mr. Crust is an orchestra and opera conductor most active in the US and Canada. Some of his recent conducting positions include Cover Conductor of the Kansas City Symphony and Nashville Symphony, Assistant/Cover Conductor of the Boulder Philharmonic, Music Director of the CU-Boulder Campus Orchestra, and Assistant Conductor of Opera McGill. Mr. Crust was selected as Assistant Conductor for the Carnegie Hall Weill Institute’s National Youth Orchestra of the USA in 2017, where assisted the orchestras and Giancarlo Guerrero in a side-by-side performance with the Philadelphia Orchestra, and a final concert at Carnegie Hall. He was invited back for the summer of 2018 to assist Michael Tilson Thomas for the tour of Asia. As a winner of the 2018 Ansbacher Fellowship, selected by members of the Vienna Philharmonic, Mr. Crust attended the Salzburger Festspiele throughout August 2018 with full access to all Festival performances and rehearsals. Furthermore, Mr. Crust was the only American invited as a semi-finalist for the 2018 Nestlé and Salzburg Festival‘s Young Conductors Award and conducted the Austrian Ensemble for New Music in May of 2018. Mr. Crust has performed as a conductor on three continents. Recent guest engagements include concerts with the Winnipeg Symphony Orchestra, Hartford Symphony, l’Orchestre de la Francophonie in Québec, the Boulder Opera Company, the Colorado New Music Ensemble, the Pendulum New Music Series, and the Colorado College Summer Music Festival. Abroad, he has led concerts with the Orchestra Giovanile Italiana in Italy, Hamburger Symphoniker at the Mendelssohn Festival in Germany, the Moravian Philharmonic in the Czech Republic, the Filharmonia “Mihail Jora” of Bacau, Romania, and the Orquesta Sinfónica de Chile in Santiago. In 2017 he was awarded first prize at the Accademia Chigiana by Daniele Gatti, and received a scholarship and an invitation to guest conduct the Orchestra di Sanremo in Italy. Mr. Crust has been influenced by a number of teachers and conductors from around the world, most notably Daniele Gatti, Marin Alsop, Alexis Hauser, Scott Yoo, Gustav Meier, and Markand Thakar. In 2016 he was selected to audition for Riccardo Muti and Renata Scotto for Muti’s Italian Opera Academy in Ravenna. He completed his doctorate at the University of Colorado Boulder in 2016 with academic emphasis on Brahms performance practice and made a French-to-English translation of Igor Markevitch’s analysis of Beethoven’s symphonies.